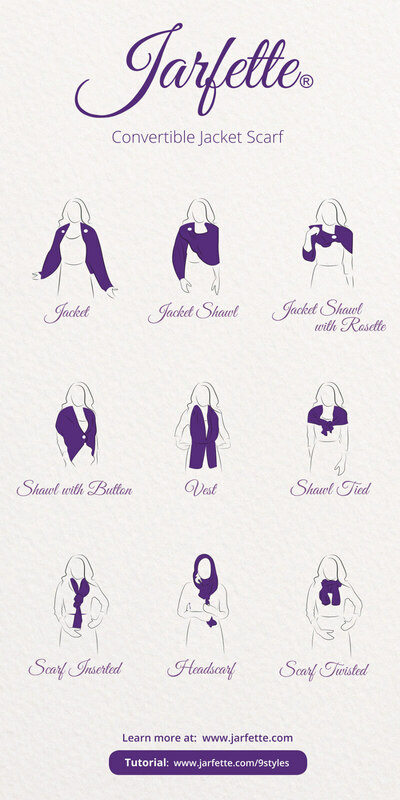 The patent pending, Jarfette Jacket Scarf changes the look of an outfit as it converts into 9 styles including a jacket, a vest, shawls, scarves, and headscarves. The sleeves and magnetic buttons help create the different styles. We offer two collections, The Rose and The Lotus. Create your own unique style! The Rose Collection is a great choice for special occasion and events such as weddings and galas, where a special dress or more formal outfit needs to be matched, or for the woman who wants to stand out from the crowd with a unique look. The Lotus Collection is for the woman who is looking for versatility and who appreciates the value of high quality clothing that can keep up with her busy lifestyle, whether she is traveling for business or pleasure and wants to pack less. Copyright 2017 Carol Ann's Fabrications, LLC. Website Design by Tomo 360.